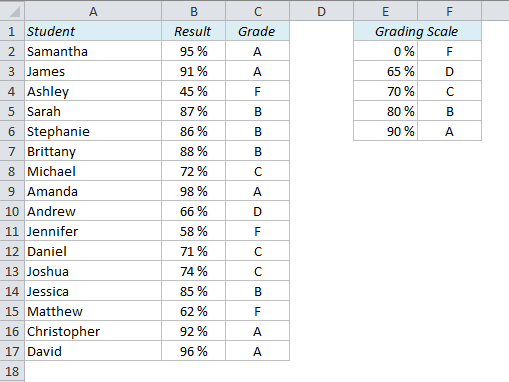 How can we calculate the grades (A-F) in Excel if we have the test results as numbers? We know that a score of 90% or higher is an A, 80-89% is a B, 70-79% is a C, 65-69% is a D and less than 65% is an F.
It is important that the table is sorted in ascending order, with the numbers to the left and the letters to the right. Now we can use the VLOOKUP function to look up the value in the left column and return the value in the right column. The VLOOKUP function looks for a value in a table and returns another value on the same row in that table. Sometimes you want to look for an exact match, but in this case we want to find an approximate match, ie. if the score is greater than or equal to 70%, but less than 80%, the student gets a C.
The first argument in this formula, B2, is Samantha’s result, in percent. The second argument, $E$2:$F$6, is the lookup table. Don’t forget the dollar signs (shortcut: F4) to lock the reference in order to be able to copy the formula down. The third argument, 2, is the number of the column that has the value we’re looking for. VLOOKUP also allows for a fourth argument; exact match or approximate match. In this case we want an approximate match, which is default for this function, so we don’t have to specify it in the formula. Copy the formula down, and the grade report is done! Neither VLOOKUP nor INDEX+MATCH will work here. We have to use a nested IF-function. I would not recommend this solution unless it’s absolutely necessary. It’s difficult to write the formula, especially if you have a larger table than in this example, and the risk of error is a lot higher than if you use the VLOOKUP method. This entry was posted in Easy Tricks, Tutorials and tagged easy excel, Excel, grade calculation, VLOOKUP by Audun Danielsen. Bookmark the permalink. to compute the grade accurately for marks such as 90, 80, 70, and 65. Morin’s INDEX/MATCH works flawlessly. Correct me if I made mistakes. 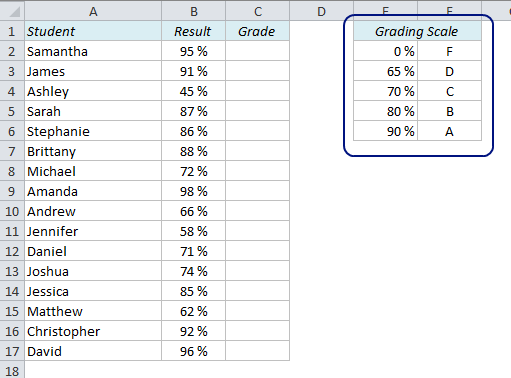 I request you to help me in grading using that type of grading because I tried it out with the method up but I failed. In such cases, I need one column that shows whether the student passed or failed and another column shows the Division for those who passed and 'No division' for those who failed. How can we do? Your support will be helpful. For "Value if true" you can use the VLOOKUP formula described in the article, with the lookup value expressed as the average of the columns. how to do the calculation …..with bellow condition….